• Brake fluid flushes. Don’t trust a shop that recommends you flush your brake fluid regularly. Brake fluid can last as long as your vehicle. There are exceptions, however. Your brake fluid might legitimately need to be flushed if moisture gets into the system or the brake fluid has overheated. • Power steering fluid flushes. Power steering fluid can last the life of a vehicle, too, unless otherwise noted in the vehicle’s maintenance schedule. What to do: Inspect the fluid once or twice a year, or ask a trusted mechanic to do so for you. It should be flushed and replaced if it smells burnt or you see black grime or metal flakes in the fluid—shining a light into the reservoir can help you spot these flakes. 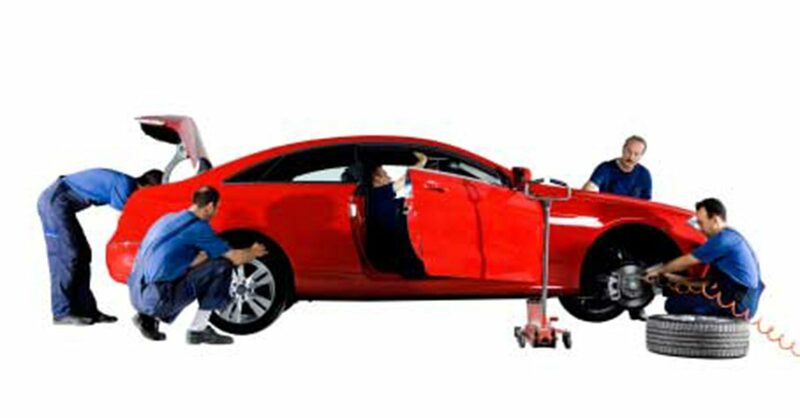 There could be an underlying problem that requires a mechanic’s attention as well. Otherwise there’s no need for the flush. • Transmission fluid flushes. Automatic transmission fluid should be flushed occasionally—but some disreputable quick-lube shops recommend these flushes to seemingly every customer who comes in for an oil change. Most of those flushes are completely unnecessary and in some cases, might even hurt the transmission. What to do: Have your transmission fluid flushed every 35,000 miles or so. Make sure that the shop replaces the filter when it changes the fluid. Some ­automakers say a transmission fluid flush isn’t necessary until perhaps 100,000 miles, but transmission fluid is an oil and oil can break down over time, so this is one situation where it makes sense to err on the side of caution. • Engine oil flushes. Ask some quick-lube shops and mechanics for a $25 oil change, and they will try to sell you a $100 to $200 engine oil flush. They’ll claim this is the only way to clear years of sludge out of the engine. Trouble is, any sludge that an oil flush does dislodge could clog the oil pump pickup screen, causing more problems than it solves. What to do: Have your oil changed, not flushed. Get oil changes according to your vehicle’s maintenance schedule—that’s likely every 5,000 miles or 7,500 miles, not every 3,000 miles, the old rule of thumb. Lean toward a high-quality synthetic oil, such as AMSOIL or Mobil 1, assuming that synthetic oils are recommended as an option in your vehicle’s owner’s manual. These cost a few dollars more but do a far superior job protecting your engine. Keeping a car clean might seem like a wise investment, but in some cases it’s money misspent. • Brake system cleanings. This typically involves taking the brakes apart and washing or even sandblasting the components, usually at a cost upward of $100. It’s probably unnecessary. Modern braking systems are designed to pretty much take care of themselves without this treatment. What to do: Don’t agree to this unless it is recommended by a mechanic you trust and your vehicle has experienced a braking problem, such as a high-pitched squealing even though the brake pads are not yet worn out, which could be a sign that glazing has developed on the brake parts. • Fuel system cleanings. Quick-lube shops sometimes recommend these ­every 5,000 or 10,000 miles. They inevitably claim that this $100-to-$150 service will pay for itself in improved gas mileage. That’s true only if the fuel injectors were badly clogged. Fuel injectors can become clogged and require cleaning, but this generally happens slowly. What to do: Get a fuel system cleaning every 35,000 miles or so. Anything more is overkill. Have this work done by a mechanic in a fully equipped shop that appears very well-stocked with modern-looking computerized equipment. Doing fuel system cleanings properly requires specialized equipment, tools and know-how that many shops lack. • Any service offered by a car wash beyond the wash itself. The paint sealants, protectants, under-car sealant and color waxes that car washes offer tend to be virtually worthless. They’re likely to wash away the first time the car is out in the rain. What to do: The only service worth paying for at a car wash is a car wash.
• Buying generic brake pads or delaying brake pad replacement. Low-­quality brake pads will wear out faster than higher-quality pads. That means you’ll have to return to the shop sooner to replace them, more than offsetting any money saved by buying the cheaper part. What to do: Replace your brake pads as soon as they have worn down to less than one-quarter inch in depth. It might be time to replace the pads if your brakes consistently screech, too—perfectly good brake pads might screech on wet days, but if the brake pads are still good, that screeching likely will not persist throughout a long trip or once the weather dries up. Opt for high-quality brake pads, such as those made by Wagner or Bendix. These typically cost $15 to $20 more per pad than the generics, but that’s a small price to pay for longer pad life, longer rotor life and greater safety. The original-equipment brake pads sold by dealerships likely are fine, too, but might be expensive. • Not replacing the air filter regularly. There’s no good excuse for not replacing your vehicle’s air filter ­every 10,000 to 12,000 miles. Air filters are inexpensive—usually $15 to $20—and putting in a new one is a simple do-it-yourself job in most vehicles. If you don’t want to do this yourself, a mechanic should be able to do this for you for the cost of the filter and a half-hour’s labor or less. Continue to use a dirty air filter, and you cost yourself money by reducing your car’s fuel efficiency. What to do: If you want to minimize the long-term cost and hassle of replacing air filters, buy a K&N air filter (800-858-3333, KNFilters.com). These typically cost $40 to $60, but unlike conventional paper air filters, they can provide excellent fuel efficiency and filtration for the life of your vehicle. Just clean them every 50,000 miles using a K&N cleaning kit designed for the purpose. The kits cost around $10 to $12 and last for many cleanings. • Washing your car with household soap. Common household soaps, such as dishwashing soap, might remove the wax coating from a vehicle or otherwise damage its finish. What to do: Wash your car only with pH-neutral wash solutions specifically designed for use on vehicles. These are available in auto-parts stores and in the auto sections of discount stores. Or take the car to a car wash.